Join us for a day of inspiration. Nourish your mind, body, and soul. 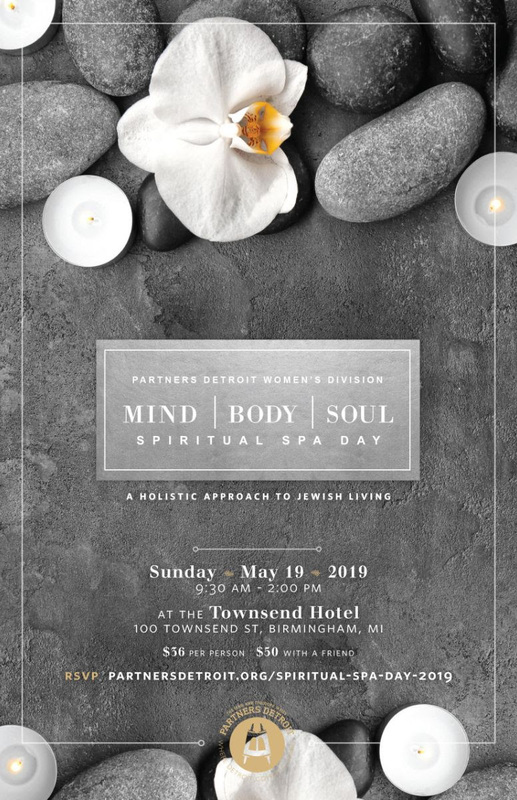 Next month, Partners Detroit Women’s Division will be hosting its 4th annual Spiritual Spa Day. 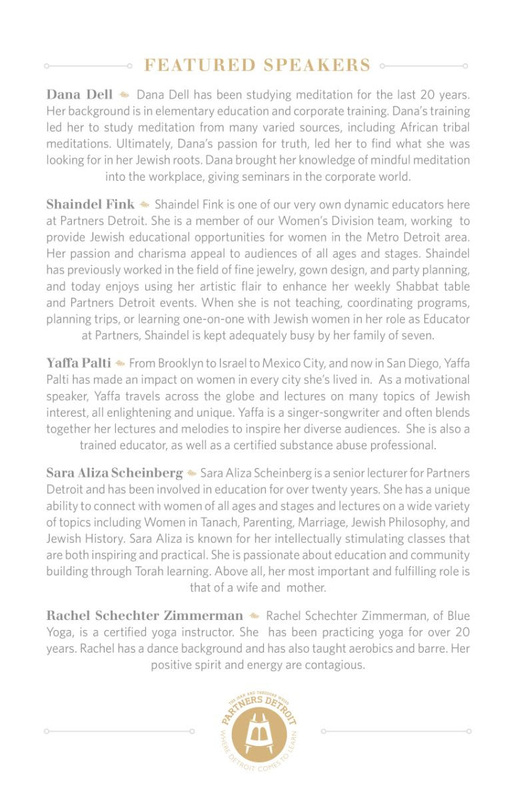 Immerse yourself in compelling Jewish workshops on the mind, body and soul, and learn about finding true inner peace. 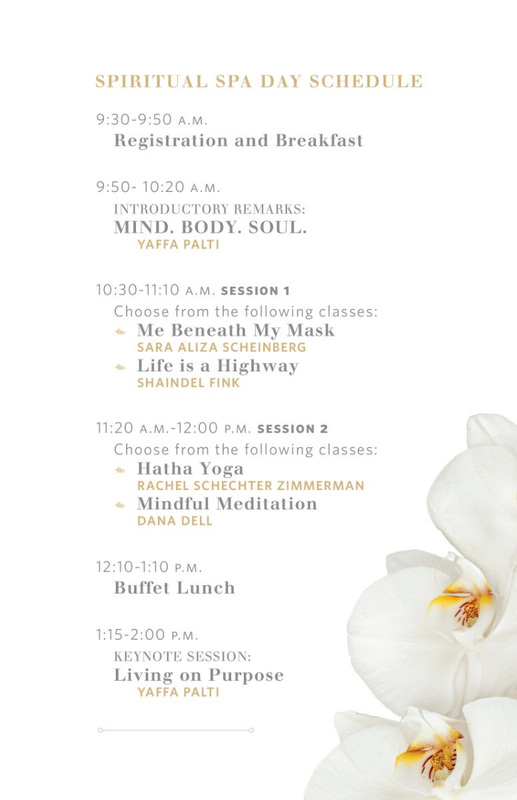 Enjoy inspiring lectures, special sessions of yoga and meditation, and a tasty lunch buffet in the beautiful setting of The Townsend Hotel. Join other women from around the community and pamper yourself- mind, body and soul! Sunday, May 19th from 9:30 a.m. – 2:00 p.m. at the Townsend Hotel in Birmingham. To RSVP or for more information, please call 248-JUDAISM (583-2476). Throughout the ages and across cultures, the question has always been asked. Where does one find happiness? The pursuit of happiness is our constitutional right, yet most of us falter in our attempt to achieve it. Torah wisdom teaches that happiness is something we create and cultivate from within. Join us to learn how to attain and maintain true happiness. Stretch and strengthen, not only our bodies, but our minds, as we find harmony in this slow flowing Hatha Yoga class. This session will blend balance and flexibility in a fitness format and will leave you feeling centered, relaxed and peaceful. Please join Leeba and discover your inner and outer potential through Yoga! Meditation has been practiced for thousands of years and is consistent with with traditional Jewish thought. 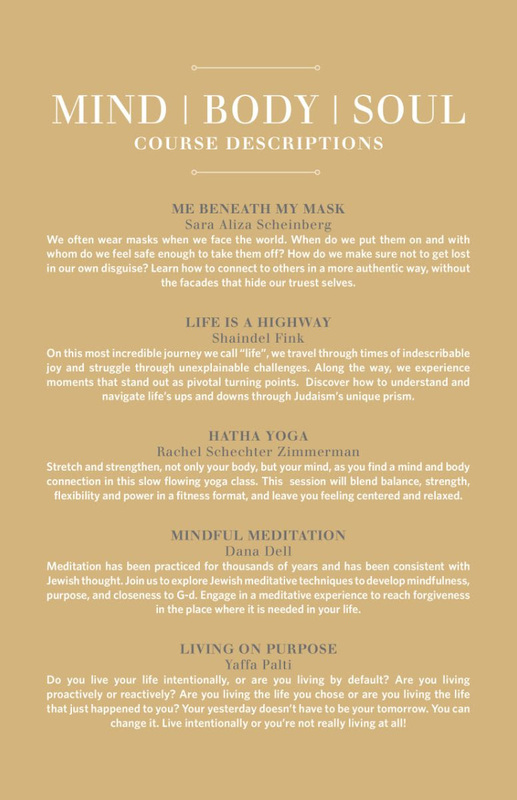 Join us for a meditative experience where we will explore Jewish meditative techniques to develop mindfulness, purpose, and closeness to G-d.
Life is constantly throwing us curve balls; a challenging child, a difficult spouse, a frustrating job. Often we are left with the feeling, “This is not what I signed up for.” Join us as we discover Judaism’s age-old secret for understanding hardship and achieving serenity. Uncover another reality; a deeper, more spiritual existence. Learn how to find the inner peace that comes with aligning your mind, body, and soul. In a world full of noise, social media, and never ending todo lists, learn to connect to your innermost self through the soul’s unique language: Silence. Symbolized by the Aleph, the depth of our personalities can be accessed only through the medium of stillness and quiet. Let’s explore how an ancient Hebrew letter can be a powerful tool to achieve tranquility in our busy world. There’s something standing in between the me of yesterday and the me of tomorrow. What is it and how can I conquer it? Learn how to take home the messages of today and incorporate them into tomorrow.